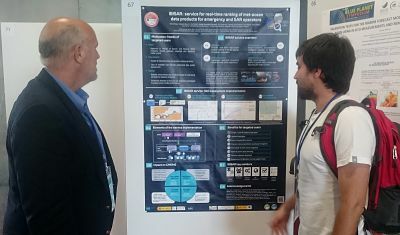 SOCIB presented the IBISAR service for real-time ranking of met-ocean data products for emergency and SAR operators at the 4th Geo Blue Planet Symposium held in Toulouse, France, 4-6 July 2018. The symposium was organized by the Oceans and Society: Blue Planet, an initiative of the Group on Earth Observations (GEO). It was co-hosted by Mercator Océan, Copernicus Marine Environment Monitoring Service (CMEMS) and the Université Fédérale Toulouse Midi-Pyrénées. The objective of the symposium was to discuss about the societal information needs resulting from the important role the oceans play in Earth’s life-support system and the challenge of minimizing the impacts of human activities on the oceans while utilizing the resources of the oceans to meet our needs. The meeting focused on maritime shipping, fishery and marine energy (renewable, oil and gas) industry, although valuable discussions around maritime safety where also conducted through the sessions. The symposium brought together between 200 and 250 participants, comprising leaders and representatives of various international organisations and networks, research scientists and postdoctoral and graduate students, who took part in a total of 49 oral presentations and 112 poster presentations. This context offered the opportunity for SOCIB to introduce the IBISAR project and to exchange ideas with producers, and targeted and potential users of ocean and coastal information. In particular, a one hour short side event was carried out where all the CMEMS User Uptake contractors (27 projects in total) made a short oral presentation, highlighting good practices of the Copernicus Marine Service and emphasizing how our institutions benefit from CMEMS. This event helped SOCIB to exchange information on its current activities and to find the opportunity to meet the other contractors in order to increase our User Uptake network, and discover potential synergies with other projects and ongoing similar services (e.g. NOOS-Drift, CMEMS DEM4-Lot5, May 2018-Nov 2019).